Birmingham's marathon has been cancelled to allow for a "redesign" ahead of the 2022 Commonwealth Games. The Great Run Company said ongoing building and road works in the city have restricted options for a new route for this year's event. Thousands of people took part in the inaugural run in October 2017. Anyone who had already signed up will be given a refund and discounted entry to the Great Birmingham Run. The company said it had been working to "improve" the route after feedback from runners. In a statement, it said sharing the route with the half marathon in 2017 "wasn't ideal for runners". Since the announcement that the city would be hosting the Commonwealth Games, it said the marathon had "extra significance" and extra time would be taken. 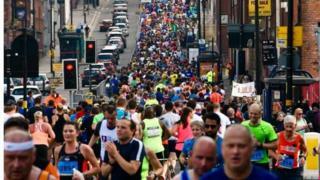 Paul Foster, chief executive officer of The Great Run Company, apologised to those who entered but said it is a "sensible decision". He said: "Rather than compromise the event, it's better to go back to the drawing board." It is hoped that a new date and improved route will be announced later this year. The Great Birmingham 10K will take place on 6 May, with the Great Birmingham Run Half Marathon still set to go ahead 14 October.